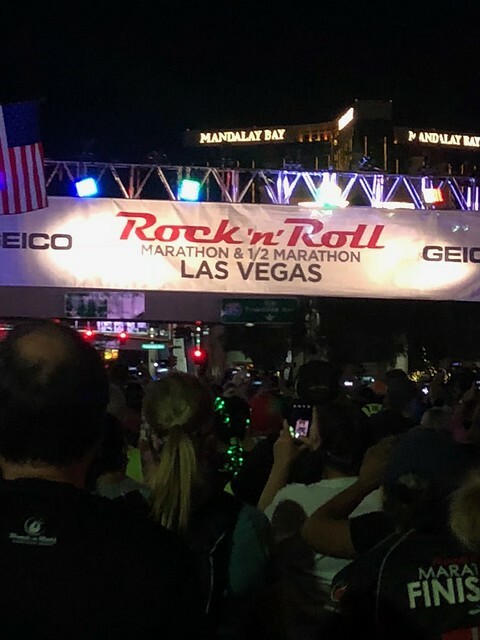 Everything that happens in Vegas, stays in Vegas… except for the blisters and sore muscles from the Rock ‘n Roll Las Vegas Races. 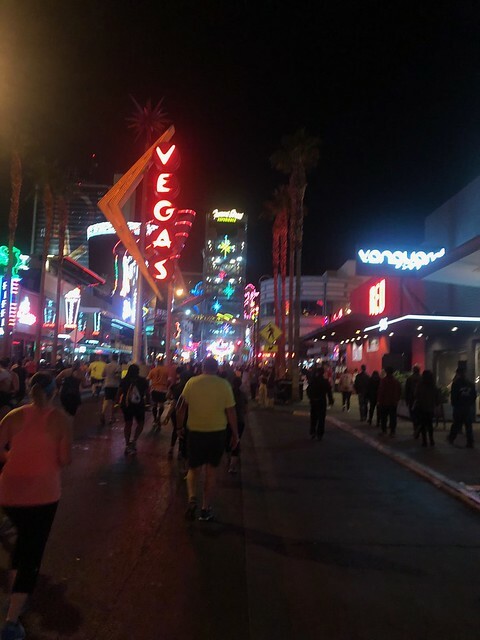 On November 12th thousands upon thousands of runners pinned on their race bibs, hit the oxygen and vitamin bars to recover from their Las Vegas fun the night before they hit the strip ready to run. As a half marathon participant, I had to be aware of what color my bib was as there were so many runners that we were sent out in different waves. I was lucky to be in the first wave of runners, which started at 4:30pm. I slowly made my way to the start line and checked out the scene. It was insanity. There were so many people that you could barely make it through the crowds. Within the starting waves were several corrals where people were sectioned by anticipated race finish times, I was supposed to be in corral 7. For the 4:30pm starters, we were to be in our corrals by 4:10. I wasn’t concerned about making it in time because I have ran several Rock ‘n Roll races before. However, the Las Vegas race is a whole other beast and I should’ve been concerned about making it in time. As I funneled my way down the street and found the entrance to the corrals, I was shocked to see a mass of people crammed together waiting to be crammed through the gate. At the gate were three security officials checking every single runner’s bib. I was smashed between anxious runners screaming and clamoring to get into the starting runway. I stood there not able to move at all with people pressed up against me at every angle. Eventually, I got pushed through the gate and started worming my way down the corrals. This was no easy feat. The corrals were full and we had to squeeze through people with other people behind us literally pushing to get through as well. There were a lot of angry words exchanged by runners and people pushed, stepped on, and smashed into each other. Finally, I gave up and stayed in the corral I was able to get to, knowing I would start no matter what. We stood there, crammed together for 20 minutes, which is quite a bonding experience. I got to know some lovely runners around me. The option to stretch, warm up the legs, or anything was absolutely out of the question. There wasn’t even a way to bend down and tie a shoe if you wanted to. Soon, the announcer on the loud speaker started having a countdown to the race. We did the national anthem and fire shot out of the top of the race starting line. It was pretty neat and definitely got me excited to run. Then, they let the first wave go from our starting time and we slowly inched our way forward in anticipation of being able to move away from each other soon. Another wave went, and another and another and finally, it was our turn! We bolted from the start with probably more excitement to be able to move than anything at all. We had been informed in a race email that the first 2.5 miles would be in silence as we ran past Mandalay Bay in honor of those that had been horrifically murdered just a month earlier. 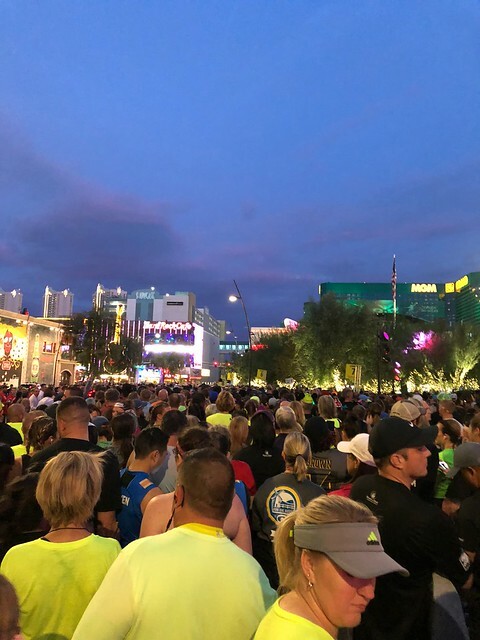 The field of runners was full of excitement and energy as we made our way down the strip to the Welcome to Las Vegas sign and turned the corner to follow back down the strip in the opposite direction. We ran past hordes of crowds cheering us on and holding signs as we passed by all the casinos and bars. It was a great way to run a race. There was so much to look at and so much noise and motivation. Musicians were sprinkled along the course in true Rock ‘n Roll fashion, including a KISS cover band. The stratosphere came into sight and I think a lot of us thought this was our turn around point, but it wasn’t, we continued down the streets past all the adorable wedding chapels and a different area of Las Vegas. Then we rounded around a block and headed back down the strip in our original direction. Slowly, the stratosphere came back into view and we knew there were only a couple miles to go. The final miles were again covered with fans and excited screams of encouragement. Finally, the Mirage Hotel and Casino and finish line were in view and runners dashed in to cross the line and collect their medal. The medal was a really neat spinning dice that was very unique and fun. We made our way down the longest finishing area ever, collecting bananas, water, chocolate milk and more along the way. Finally, we were able to get over one of the street barriers to be reunited with our families there to cheers us on. It was an incredible and memorable race. This is definitely one I want to run again. The casinos and fans along the way made it so much fun and exciting. The race was so crammed and busy but put on very well. There was a ton of security this year, which made everyone feel very safe and taken care of. The course was perfect, the medals were awesome and the shirts were cute. 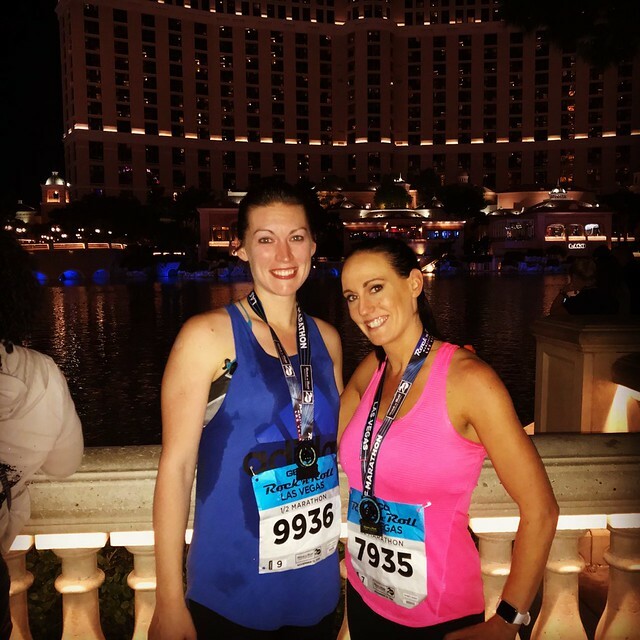 I highly recommend this race to anyone that wants to take a fun weekend trip to Las Vegas!